You've seen this picture before, but it was a long way back, so I'll repeat it. On the left is my cousin Jean. We have the same middle name. I am about six months older, and I'm on the right. Her two younger sisters are between us, Lavina (Viney) and Wendy. This picture was taken in the summer of 1956. I call us cousins loosely. We are related somehow, but had never actually figured it out. We both know that the documentation existed, but hadn't looked it up. Actually, Jean and I haven't seen each other since we were 14, but have connected by email in the past few years. So, now, we are getting interested in figuring this out. We speculated that our grandmothers were first cousins, but after some intensive searching of piles tonight, I now have the actual answer. First of all, here are Jean and me. She recently revealed her face on Facebook, and it's neat for me to see her. She looks like her grandfather's side of the family, but I look more like my mother's. 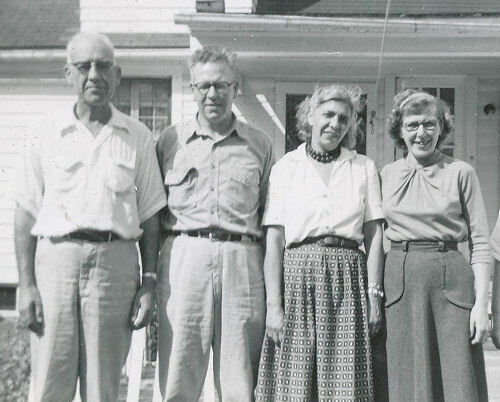 I have a picture of all our parents together, also taken in 1956. My dad is on the far left, then Jean's dad, George Kilquist. Next is my mom, Catherine Rowe Leary, and then Jean's mom, Nancy. Nancy is still alive and doing well. The blood connection is George and Catherine. I can do one more generation back with pictures together. 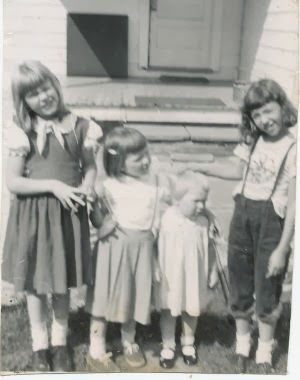 The lady on the far left is Mabel Hall Kilquist, Jean's grandmother. Then come her two siblings Mary and Gilbert (Bert). Jean thought there was another, Percy, and she was right. It's in the records, but he had died before this picture was taken, I believe. On the far right is my grandmother Emily Marquerite Fisher Rowe. Did you notice the re-appearance of the "Hall" name? And that was as far as Jean and I could take it in our heads. But, drum roll, Jean, here is the answer. 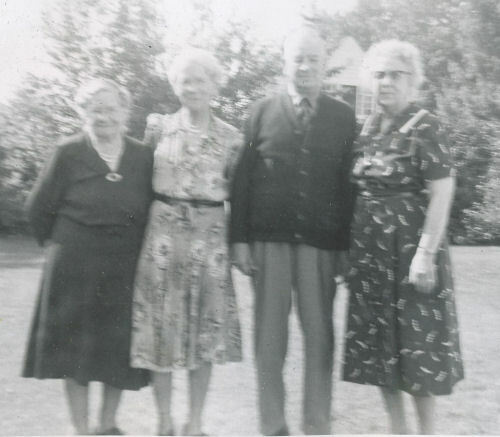 Percy, Bert, Mabel and Mary were the children of Henry Hervey Hall and Helen Leonard Williams. Emily (and Lew, Ben and Charlie) were the children of Charles Alfred Fisher and Catherine Louisa Hall Fisher. There's "Hall" again. So... yes, our grandmothers were first cousins, but the generations are a perfect match, so I think that makes us third cousins. Chuck will straighten me out if I'm wrong. Whew... sorry, no interesting stories about the people, tonight's project was just to figure out the puzzle. I am so glad you did this Joan. I would really like to take part in Chuck's meme too. But, my past is a tangled mess due to an illegal adoption and so many factors better left private! I can see the family resemblance between your mom and your third cousin, Jean. I find this a little surprising as they are second cousins. But, the family resemblance is definitely there! I'm glad you got out your old photos! I hope you are having a grand week! Yes, you are third cousins. Because there are an equal number of generations between each of you and the common ancestor, there is no "removed." Earlier, I tried several times to post a comment, but was unable. 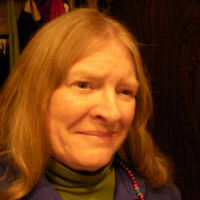 The Family Friday blog explains the timing for its posts and for the linky that is hosted there. You'll find that on the newly updated "You're Invited" page. I think it is interesting to note that the recent Jean and the recent Joan clearly resemble their younger selves. Hi Jackie- All families get messy at some point. Don't be afraid of it. Chuck- Thanks. I think the other cousin I haven't mentioned yet must be third once removed. We all trace back to Hervey and Lucinda, but there are only three generations instead of four down to the person who is about my age. Is that right? vanilla- we sure do. 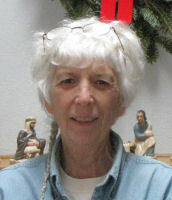 I knew I did, but as soon as I saw Jean's current picture she looks very much like a combination of two of her aunts (George's sisters). It's very strange. How Do the Newspapers Leave the Stuffer? How Do the Newspapers Move? How Does the Stuffer Open the Paper? How Far to Saginaw, Michigan?